This is a blog I wanted to write about a while ago but wasn't sure how to approach it. Truth be told, I was a bit afraid of both confronting it and what people's reactions may be as I don't find talking about myself in any depth something that comes easily. This weekend was Father's Day in the UK and it seemed that I owed it to myself to write this. Firstly for myself, and maybe you'll enjoy it too. We'll see how that goes! I've always been amazed at cinema's capacity to move people. To create emotion in an audience, whether en masse, or to an individual. And I'm usually pretty well prepared for this. With many films you can see the what's coming before it happens, and prepare yourself if necessary. It's worth noting here, I'm an emotional guy. I'm not your stalwart granite block of masculinity, the simplest things can get my bottom lip quivering. Since having kids this is basically anything that makes me consider what could happen to my own children, or anything that uncovers deep seated issues about fatherhood that have been with me since childhood. So here's a bit of context: I'm the youngest of four children, from a single parent family. The only boy in fact. To make this a bit clearer I grew up with a mum, 3 sisters, a great aunt and a female dog. I have cousins, yep you guessed it, both girls. So the fact that I'm not wearing a princess dress still amazes me. My father left when I was four and was an intermittent presence in my life. He came, he went, he remarried, he went again, and some years ago he died. Inbetween whiles I cut him out of my life completely and when it was too late to do anything about it I realised there was an awful lot of things that I wish I'd told him. Not your mawkish huggable stuff, basically I wanted to tell him just how much of a letdown he'd been and that I felt I was much better off without his influence. But that lack of presence has influenced me nonetheless. Okay Dom, so how does this relate to films? Well, recently I got absolutely side-swiped at the cinema. I didn't see it coming and the whole thing hit me like a ton of bricks. As I said above, I can usually see this sort of thing coming and put up some sort of mental barrier. This must have been a really serious movie with grounded themes and a resonance with the harsh realities of life then? Right? The film that gave me a psychological left hook was Guardians of the Galaxy 2. Yep, you read that right. Come back. Stop laughing at me. I'm completely serious. And I was as surprised as you were. I thought I was watching a knockabout sci-fi action movie, wholly unprepared for any level of actual thinking. And I was. Well, up to a point. 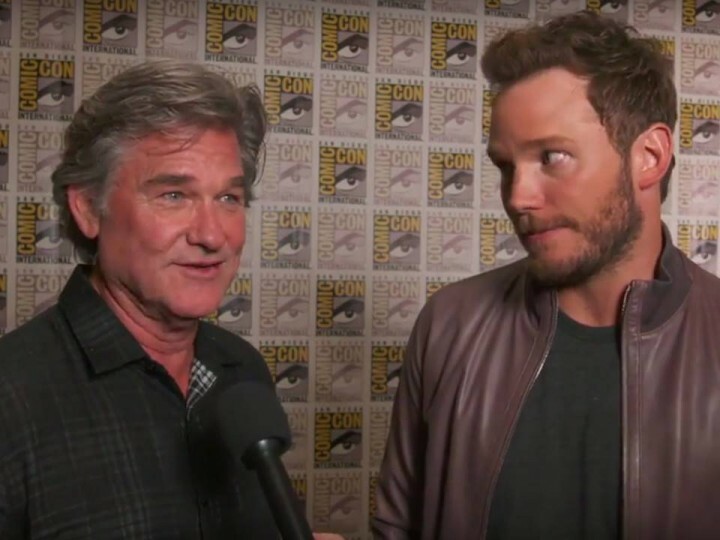 The whole plot line of Peter Quill reunited with his father drew me in, I started getting nervous once Kurt Russell and Chris Pratt came to blows, with the God-like father figure leaving his family behind with no further thought for them. The idea of a young Quill idealising this man for years struck a chord, as did their initial meeting and thoughts that everything would turn out great. And then, spoiler alert, things changed. Kurt Russell's natural tendencies took over leaving Quill devastated. At this point I was getting a bit worried. I did the usual thing and tried to think of something else, which is pretty hard when you're in front of a 20 foot wide cinema screen complete with bombastic surround sound. There was no escaping bar heading for the fire exit. And then the decisive blow came. In the midst of a spectacular space fight, Quill is told "He was your father but never your dad". Boom. That one knocked me down. It's exactly the same line that one of my sisters said to me shortly after my own fathers funeral, and it's always stuck with me. The film ended and I bumped into my mate Scot in the foyer who offered me a lift home but I mumbled something about having a walk and bobbed off down the road to sort my head out. He said later that he just thought I was a bit drunk. Upon getting home my partner Rachel asked how the film was and I said everything here. She gave me that look. The "really?" look. The look that is at once massively sympathetic and at the same time trying to work out how on earth I have got to this place while watching Guardians of the Galaxy 2. So there you have it. I'm continually amazed by cinemas ability to hit you right in the feels when you're least expecting it. And screw you Chris Pratt, I wasn't expecting that!